Where can you invest your money safely these days? Brokers want to “help” you. Investment advisers want to “help” you. Mutual fund experts want to “help” you. Newsletter writers want to “help” you. Gosh, everyone wants to help you. At a price. Is anyone telling the truth? Me, of course, and don’t trust me either. Don’t trust any adviser with your hard earned money and NEVER let anyone manage your money. You are the only one that has a proper interest. Is there any way you can tell who is truthful? First thing you need to do is make them prove they know what they are doing. Every professional should have a model portfolio. One of the answers you will get is there are several different types and they may not be what you need. Capital BS. Tell them bluntly unless you see are real time (not hypothetical) portfolio you are going to hang up. Period. Any hesitation and you do hang up. He is ashamed of his performance and you have escaped with your funds intact. One of the best traps for these financial buzzards is to tell them you have $200,000 that is now in cash and do they have a method of investing. Get them to specify the method. Now you say, “Just suppose your method doesn’t work and market goes down. Do you have another method to protect my money?” Here is where the weasel words start. If he actually does have an exit strategy tell him you want a copy of it in writing and will hold him responsible if he does not follow it. Ask and insist upon what the maximum loss that would be allowed in your account. I can guarantee you won’t get it. At this point almost all brokers escape into the bond market which they believe is absolutely safe. Currently interest rates are very low. When the rates rise again some time in the future the value of the bonds will decline. Depending on the quality of the bond (AAA or CCC) will determine how much that decline could be. Let’s say that right now there isn’t any place “safe” and investors decide to put their money under there mattress. Could be a money market account or a bank CD. Wait a minute. What about inflation? Momentarily it seems to be under control. At least that is what Washington is telling us. Creating trillions of dollars for government programs must eventually result in loss of purchasing power. 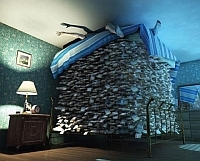 Even in the “mattress” the money isn’t “safe” from deterioration. Still it is better than betting on real estate or the stock market. At this financial point in time there is no “safe” investment other than gold, but every family should have some emergency money (to carry expenses for 30 days) in cash under their mattress.